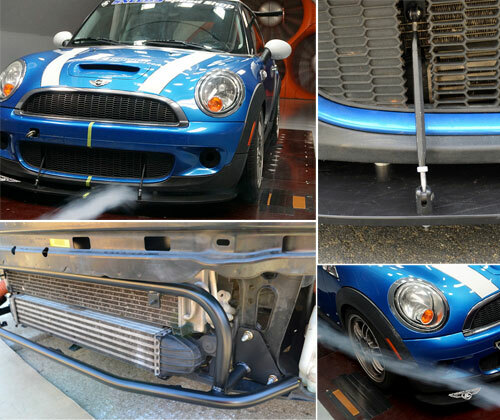 Wind tunnel-tested proprietary-designed, fully adjustable front splitter for the R56 MINI S and JCW front bumpers. This splitter is specifically designed to increase front end downforce and reduce drag. Wind tunnel testing proved a 73 lbs increase in downforce over the stock bumper at 130mph. Extra wide splitter design smoothes air flow at front tire to farther reduce drag. The splitter attaches with fully adjustable heavy-duty aircraft grade aluminum stanchions, aluminum and steel brackets and heavy duty fasteners. Splitters now carry a full 100% replacement for life with the original purchaser.